As Sione Faumuina sat back and watched the headlines unfolding from his home in Brisbane, the former Warrior and Kiwi international saw too many familiar stories popping up, and knew he wanted to help. Cue a tell-all book, The Second Phase, documenting Faumuina’s own battles against alcoholism and depression. A cautionary tale for players past and future, and something to help fans better understanding what may be going through the minds of their favourite footy stars. We chat to Faumuina about the idea behind the book, and preview a snippet of it below. 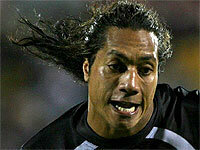 (Main photo: Faumuina in action for the Kiwis. Credit: photosport.nz). KLC: First of all Sione, can you talk us through your reasons for putting this book together? SF: The motivation for the book was to just tell my story, what went on before, during and post football. It’s not just a rugby league book, I also cover how I finally overcame my struggle with alcohol, depression and also tell my side of things that were printed in the media. Current and future players may be able to relate with what is mentioned in my book and hopefully make some decisions so they don’t make the same mistakes I did. Fans of the game will get an insight into what it actually takes to play in the NRL. Current players who may be struggling with alcohol or any other substance abuse may find answers in my book, while future players can finally see how my road to the NRL took shape and pick up tips on ways to fulfilling their potential. Coaches might also get a better understanding on how Pacific Island players think and act. It covers a lot of bases and it has a bit of everything for everyone, whether they follow rugby league or not. My best friend Sa Luatua is the brain child behind the book. I’ve known him since I was a toddler and couldn’t think of anyone else I’d want to help me, which is why we both agreed to self-publish. We wanted to tell my story the way I wanted to, with no watered down material. Unfortunately the issue of suicide is prevalent in the game right now, did that play a part in you wanting to try and make a difference? Suicide is a society issue, not just in rugby league. It’s unfair to lay blame on the game because it is impossible to know what was actually going on in the minds of these young men. I was 18 when I first moved away from New Zealand to pursue a career in the NRL, and my book will explain some of the difficulties I faced being away from family and friends. Do you feel enough is being done right now to help players deal with the pressures of being an NRL player, or even a prospective NRL player? The NRL is doing an amazing job in this area, every club has a full-time welfare and education officer, and on top off that you have former players who regularly visit clubs. Nigel Vagana, Andrew Ryan, Dean Widders and David Solomona are all employed by the NRL to facilitate and implement these programmes, from the NRL and U-20s competitions, right down to the state leagues in New South Wales and Queensland and even the domestic competition in New Zealand. Aside from the book, tell us what you are up to these days over in Brisbane? I’m currently working in insurance and own a small business. I was involved with the East Tigers Cyril Connell Cup [U-16] junior representative programme this year, and I can definitely say I have caught the coaching bug! I was fortunate to have a very experienced coach to learn from called Scott Tronc, who played during the 90s for the Broncos and Bulldogs. He has also coached at Intrust Super Cup level and was an assistant coach in the Holden Cup with the Broncos. Finally, when is the book set for release? We are looking at a release date of September 1, 2016. We posted a snippet from the book on a rugby league blog site recently and had over 20,000 views and 2000 shares. I was blown away with the feedback and can’t wait to get the book out now. I roll into my parking spot almost on auto pilot as I would every day for training. The routine drive from west Auckland to Penrose is monotonous, like clockwork, but today feels different. Slouching down in the driver’s seat cutting a forlorn figure, I stare vacantly out the window in the direction of where I can see my team mates arriving for another days grind. Here I am 23 years old, living what most boys dream of, being a professional sportsman or “rugby league star” if you will, yet I am battling, debating and fighting self-doubt and deciding whether I roll this bad boy out the carpark and leave or report to duty. My latest indiscretion added to the growing list on my rap sheet is sure to get some media air time, more immediately though, coach is going to rip shreds off me. This latest incident has cast doubt over my mental state as I start to question a lot of things. Is this battle between me and the media, me and the public, me against the world going to end right now in this very moment? If I drive out of here, there is no coming back, goodbye Warriors, goodbye rugby league. I finally muster the courage to turn off the ignition and grab my gear bag from the back seat which is nestled between a week’s worth of newspapers, coffee cups and plastic sports bottles. The mess in the back seat of my car funnily enough accurately describes my life at the moment, lacking structure, direction and purpose. I walk towards the training sheds and give a polite nod to a couple of the Aussie boys before delivering handshakes in a typical Pacific Island embrace with the boys Francis Meli, Iafeeta Paleasina and Hame Lauaki. I tell myself that I have made the right decision to turn up today, yet I don’t feel at all comfortable but as usual I put up an act and continue to laugh and crack jokes with the boys. This particular training session is nothing out of the ordinary and nothing in the session stood out other than the fact I spend every second trying to figure out exactly how I am going to tell coach Daniel Anderson that I am quitting football. He taps me on the shoulder at the completion of the last training drill and very quickly mutters that he wants to see me in his office after I finish up stretching and immediately I begin to feel nauseous. My heart is racing as I head up to Ando’s office and not because of what I am afraid he is going to say but more of what I am going to tell him. I try to quickly find the right words in my head before I get to his office door but struggle as my emotions are everywhere. “You have 20 minutes to show me something or else I will hook you from the field! Upon hearing this, his whole persona changes as if his doctor told him he has a day to live. Funny, in my naivety I thought he may come from around his desk and give me assurances that football is secondary to my welfare, hug it out and tell me not to worry we can get through this. I guess I was silently crying out for that father figure who abandoned me at an early age and who I thought could be replaced by a mentor or coach, but again I was let down. I really wanted to tell coach to shove this game and walk out and be done with it but instead I retreat back to that scared little Samoan boy still living inside telling me to back down, nod in agreement, walk out and pretend everything is cool. This made me question a lot of things about my footy career at that point in my life, but sadly the answers to those questions were slowly coming and in the process of sorting myself out I kept drinking heavily, kept getting into trouble and plastered across the front pages of the Sunday News. It was just a vicious compounding cycle because I had failed to get my mental state sorted early on in my life. Those comments from people in my circle were playing on loop in my head every time I thought of giving up. On one hand I felt guilty because I had this lifestyle others would love to have and was earning good coin to help my family, yet on the other hand I was angry with myself because I knew I had deep rooted issues that remained unresolved in my life and I had nobody I could really confide in and so I felt alone. The attention I was getting through the general public, the media, was something I was not prepared for, sure I craved it like any other young guy but once I got the full throttle of fame, I wanted to give it back. It felt like my every move was scrutinised, judged, commented on both on and off the field. The TV cameras, radio jockeys at every training session and games wanting a piece of me, strangers in the street wanting to shake my hand, VIP sections in nightclubs, copious amount of alcohol, guys wanting to drink with me, girls wanting to get with me. The lifestyle of a prominent professional sportsman was both a gift and a curse. The purpose of his book is to help the footballers of today cope with the pressures of a professional career in sport and act as an unofficial guide for dealing with the trappings that come with notoriety and success and how to overcome those obstacles. Well done Sione, about time the other side of the coin was explained to Fans who continually bey for blood.